Going green seems to be the catch phrase of late. Everyone claims to be making efforts to lower their carbon footprint, to reduce waste and to recycle where ever possible. At James Printing, we take having a green conscience very seriously because we know that we are really just leaving this earth for our children. With a plan for the future, we have made great strides in improving the attitudes of our employees and managers and encouraging a dialog of free exchange, where ideas can be raised that will help in our “green” efforts. We also try to help our clients see where they can make an environmental impact as well. We can suggest making environmentally friendly choices regarding paper stocks and using vegetable-based inks comprised of renewable raw materials that emit lower levels of volatile organic compounds (VOCs). Although price can sometimes be a factor, where reasonable, we encourage the use of recycled materials. 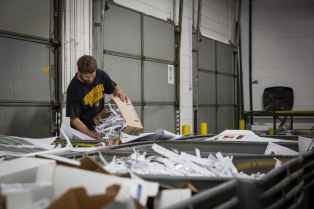 We continually strive to reduce our carbon footprint by the paper we use, as well as recycling all of the aluminum plates used throughout the printing process. Additionally, our facility recently underwent a face-lift. We installed insulation and a new lighting system that promises to cut our total energy usage in half! When shipping, we attempt to combine orders to reduce fuel consumption and we believe in a working environment of comfort for our employees where they can wear cooler, more comfortable clothing in the summer to reduce air-conditioning requirements. Being “green” is really a journey, and we’re not through yet. Our efforts to be kinder to our ecosystem will continue as we seek ways to conserve. Contact Us if you have questions about our efforts or you need advice on helping to be “greener” in your marketing.